Mistakenly referred to as “Dalmatian Jasper,” this fairly common igneous rock is found in Mexico and is a 5.5 to 7 on the Mohs scale of hardness (ranging from 1 to 10). Ancient peoples used Dalmatian Stone as a protection amulet. It’s believed to boost the immune system, assisting with bowel disorders and skin problems. The energy of Dalmatian Stone brings childlike joy and playfulness into your life. It’s said this stone is a “people stopper,” in that even strangers will notice you wearing it and will turn around for another look! Dalmatian Stone readily accepts dye and can be found in bright colors such as blue, red, green, and purple. Often made into beads, it’s especially elegant when paired with black stones like Onyx or Obsidian. 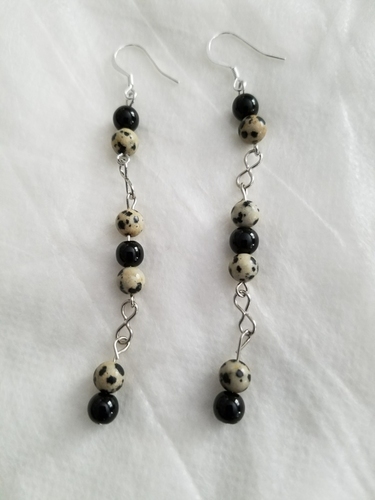 I made these 3.5-inch Dalmatian Stone and Obsidian earrings just yesterday. While not a traditional or natural birthstone, nor a zodiac gem, Dalmatian Stone is beneficial for those who are overly analytical. It’s also a wonderful sleep aid, protecting against nightmares. It’s thought to convert negative into positive energy, helping you let go of old ways of looking at the world. 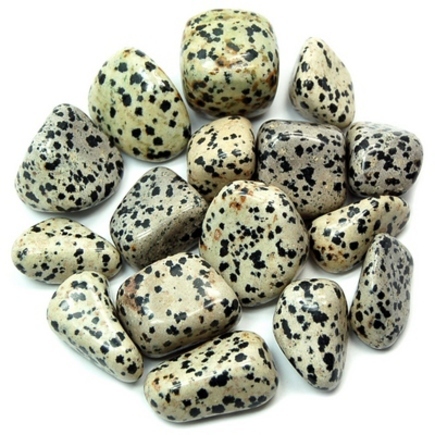 Dalmatian Stone is a good stone for veterinarians, calming and soothing animals. It helps athletes deal with sprains and cartilage problems. It cleanses the aura and dysfunctional energies, renewing your faith in others and lessening a desire for revenge. Opening the base, sacral, and earth Chakras, Dalmatian Stone helps you move forward and discover your true purpose in life. Feng Shui experts say Dalmatian Stone uses earth energy and should be placed where you rest, so you’ll feel safe and protected. Clean your Dalmatian Stone with a soft cloth and warm, soapy water. This entry was posted in Sunday's Gem and tagged "fire engine" dog stone, Dalmatian Stone, healing gemstones, metaphysical properties of Dalmatian Stone. Bookmark the permalink. I’ll be darned. I’ve never seen these stones before. Thank you, Debbie. Thanks for reading, John. Aren’t they cute?? Debbie, do you know what’s funny? Last week at work, a customer brought in their dalmatian dog to our store while they were shopping. So how ironic is it that you posted about the gemstone – Dalmatian! Which btw, I knew nothing about, so I found this post very informative. And I can see that because first looking at this gemstone, that’s exactly how it appeared to me – childlike and playful. The earrings you made are just beautiful! I love the colors black and white together in design. Once again, my friend, great post! Thank you. Thoroughly enjoyed! I’m delighted you find this stone “childlike and playful,” Ron! Who wouldn’t want to walk around with a miniature fire doggie on their wrist, ha?! Glad you enjoyed this one. I learned a lot, too. In fact, I saw these stones and purchased them before doing the research and learning just how helpful they’re touted as being. Sometimes I get lucky!! A real specialness about these stones. I like their character a lot. Thanks for sharing, Debbie. Thanks for dropping in, Audrey. Glad you find them as interesting as I do! Thank you, Cindy — hope you had a lovely weekend! Really? Maybe that’s particular to the States, but most fire stations have an actual Dalmatian (or just a statue) as their “mascot.” https://www.akc.org/dog-breeds/dalmatian/ They’re beautiful animals with those spotted coats! I understand they’re quite athletic, too, and would be perfect for an on-the-go owner. Maybe you should write a story about a hundred and one Dalmatian Stones! I’ve never heard of these either, and they really are beautiful. I so enjoy these posts where you introduce us to these unusual stones. Whatever benefits this one may or may not provide, it’s already provided the benefit of being interesting and beautiful. What could be better? You know, Linda, I wouldn’t mind having 101 Dalmatian Stones myself!! I don’t know if I completely “believe” all the metaphysical properties of any stone, but I’ve found it enlightening to research them (and who knows? Everything is comprised of matter, and it stands to reason that different stones “do” different things for the wearer). Maybe next time I’m lying awake at night, I’ll tuck one under my pillow and see if it helps me sleep! Sgt. Stubby, Beauty. All gems! I think I will stop by the rock store and send her a piece of Dalmatian Stone (which I had never heard of)– a breeder with new puppies can always use a little help from the attributes this stone shares. Thanks for introducing it to me! Have a great day–Rainy in Chicago. Aw, nothing like a basket full of new puppies — spotted puppies, to boot!! I think your breeder friend would be grateful you thought of her with such a lovely stone. Just don’t let the wee ones get ahold of it and gag!! We’ve had rain and thunderstorms for the past several days — lots of flooding everywhere, and I hate imagining what all this water has done to my tomato plant. I’m 65 and I’ve NEVER seen those stones in my life. Amazing! Woo-Hoo, I love introducing my friends to new stones, Tanya! I didn’t know anything about these Dalmatian Stones when I bought them either, but I’ll be interested in seeing if they’re really as helpful as they’re touted as being.